Francisco Kjolseth | The Salt Lake Tribune Jazz portraits. Bear. Since Jazz Bear’s debut 24 years ago, there was one guiding force entertaining fans, racking up awards and setting the example for how a mascot can become “iconic” — Jon Absey. But, as the 2018-19 season began for Utah on Friday, Absey wasn’t behind the fur. That’s because the Utah Jazz fired Absey this week due to reasons that include ongoing disputes with management, according to multiple sources. The organization declined to discuss the rationale for Absey’s departure, but it confirmed that he is no longer its employee. Absey did not return calls requesting comment. As the Jazz Bear, Absey won the 2017-18 Mascot of the Year award this summer, his fifth time winning the award. He also won this year’s Mascot Leadership award and a Best Video award at the annual NBA Mascot Conference. 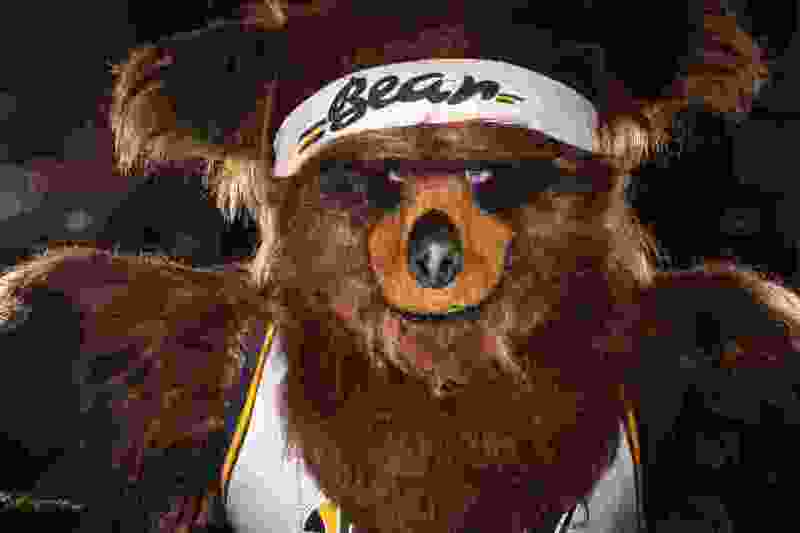 Absey, as Jazz Bear, was inducted into the Mascot Hall of Fame in 2006. Absey climbed more than 1,000 ladders, dunked more than 4,000 times and used 55,000 cans of silly string in more than 800 home games with the Jazz. He was known for his daredevil stunts, including sledding down stairs, jumping through fireballs, and doing handstands on ladders during timeouts and quarter breaks. He also had a showman’s sense of humor, playfully needling courtside fans, referees and security staffers. Absey, 50, started as the Jazz Bear in 1994 after various stops as mascots in minor basketball leagues. He spent six years in the Army National Guard, according to his LinkedIn page. In an advertisement from the 2016-17 season, it was revealed that the then-unidentified Absey had suffered two concussions and 17 ligament tears in his time with the Jazz, requiring seven surgeries. But in a surprising twist, it wasn’t the physical toll that necessitated Absey’s surprising departure. On Friday, narratives differed as to the major reasons, but a consistent part of the story was the fractured relations between Absey and Jazz management. The Jazz plan to replace Absey for the long term, and a new Jazz Bear performer was in uniform for Friday’s home opener against the Golden State Warriors on an interim basis. The new Bear greeted front-row fans and the Jazz during pre-game introductions. The performer also gave the fans a Bear classic, hitting giant golf balls into the crowd while wearing stilts. Red Rocks’ MyKayla Skinner frustrated after medal-less finish at NCAA Gymnastics Championships. Was this her final meet as a Ute?